Lambeth's Sustainable Transport Team will be running their Dr Bike service this evening, 7 October 2015, in Brixton's Windrush Square, SW2 1EF. 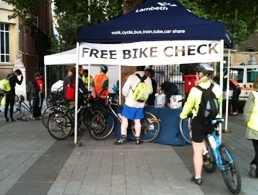 Come along between 4 and 8pm to get your bike checked to carry on cycling through the winter. As an extra incentive the first 20 people to attend will get free bike lights.